Tyler Anderson. Credit: Ron Chenoy, USA TODAY Sports. 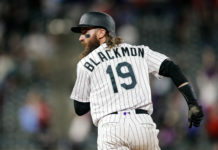 The Colorado Rockies were unable to salvage the rubber match of their weekend series with the St. Louis Cardinals Sunday afternoon, losing 12-3. The Rockies fell to 71-59 this season, half a game back of the Arizona Diamondbacks in the NL West. 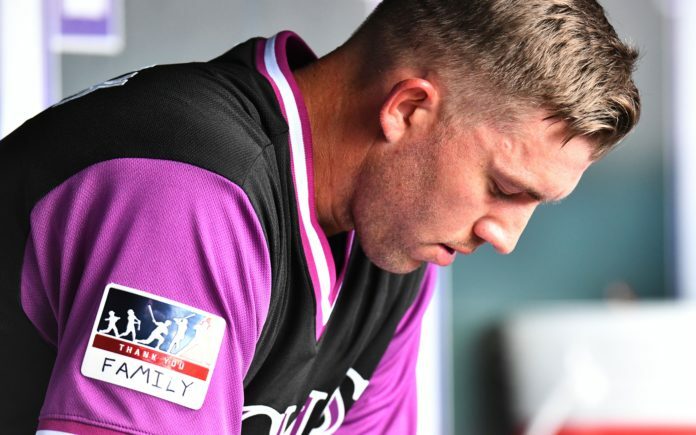 Rockies’ starting pitcher Tyler Anderson struggled out of the gate for the Rockies as he issued a lead-off double to Matt Carpenter to open up the ballgame. After recording back-to-back outs, Anderson surrendered a two-run home run to Tyler O’Neill, which put the Cardinals ahead 2-0. The Cards then recorded consecutive singles with Harrison Bader then hitting an RBI double to left field. Austin Gober later reached base on an infield single that allowed an additional two runs to cross the plate for St. Louis. Carpenter followed by hitting an RBI double to right field to put a cap on the six-run first inning from Cardinals. Anderson did not make it out of the first inning and finished with a line of 0.2 innings pitched, allowing six runs on seven hits. Chad Bettis replaced Anderson on the mound in the first inning. The Rockies scored their first run of the game in the second inning when Ian Desmond hit an RBI double to center field, scoring Matt Holliday, who reached base on a single hit to right field. The Cardinals quickly piled onto their lead in the third inning, starting with Jedd Gyorko hitting a leadoff single. Gyorko later advanced to second base on an error by Holliday with Bader then reaching base via a throwing error committed by catcher Chris Iannetta. The Cardinals then scored when Munoz grounded into a fielder’s choice, allowing Gyorko to cross home. Carpenter later hit an RBI double with Yadier Molina and Jose Martinez each driving in runs via base hits to extend the Cardinals lead to 10-1. Bettis finished with a line of 3.1 innings pitched allowing four runs (0 earned) on four hits while striking out two batters. Trevor Story drove home a run in the third inning when he grounded out to the right side of the infield, allowing DJ LeMahieu to score. The Cardinals added another run in the sixth inning via a sacrifice fly with the Rockies managing to scrape another run across the plate in the eighth inning when Gerardo Parra scored via an infield groundout. Colorado did not start the game on a strong note and simply did not look like they came ready to play, Sunday. 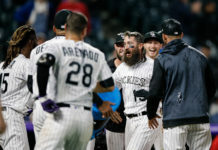 While the Rockies have been one of the hottest teams in the sport of late, they have endured a few head-scathing losses on their recent home stand, including Sunday’s defeat and a deflating series loss to the putrid San Diego Padres. The Rockies will travel to the Los Angeles area to take on the Los Angeles Angels of Anaheim in a two-game set with first pitch set for Monday at 8:07 MST.